All people of faith struggle at times to sustain a flourishing prayer life--a loss felt all the more keenly in times like ours of confusion, political turbulence, and global calamity. 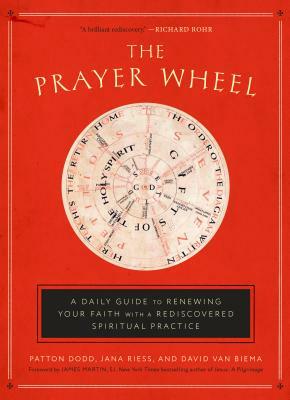 The Prayer Wheel introduces an ancient prayer practice that offers a timeless solution for the modern faithful. DAVID VAN BIEMA was head religion writer at TIME from 1999 to 2009, where he wrote 25 cover stories for the magazine, as well as covers for Life magazine, People, and the Washington Post. His recent work has appeared in TIME, the Washington Post, TheAtlantic.com, and the Religion News Service. He is the author of the book Mother Teresa: The Life and Works of a Modern Saint. PATTON DODD is a writer and editor whose work has appeared in The Wall Street Journal, Washington Post, TheAtlantic.com, CNN.com, Financial Times, Newsweek, Slate, Christianity Today, The Shambhala Sun, and more. He has also appeared on a range of television and radio shows, including Hannity, The Laura Ingraham Show, ESPN Radio, and NPR. "I am always looking for ways to engage in prayer more deeply. Beautifully written and biblically grounded, this book offers readers a fresh yet ancient way of drawing close to God. Because of its simplicity and depth, I am sure I will enjoy using it for years to come."